Hungarian State Opera - LOL: Three Pieces by Hans van Manen Event home HamiltonThe PromNetworkTo Kill a MockingbirdKiss Me KateHadestownOklahoma! On paper, Hans van Manen's Nordic austerity and sophisticated vocabulary are a perfect match for Budapest's noble, monumental spirit. 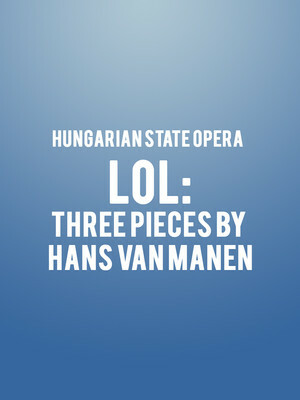 Why See Hungarian State Opera - LOL: Three Pieces by Hans van Manen? Joining forces with the Hungarian National Ballet, the Opera closes their exciting short residence with LOL, three pieces by internationally acclaimed Dutch choreographer Hans Van Manen. Renowned since the 60s as a pioneer of the synthesis between academic ballet and modern dance techniques, Van Manen presents a sensual duet set to Erik Satie's beloved piano pieces entitled Trois Gnossiennes, the fiery energy and tango-infused choreography of 5 Tangos and the witty spirit and sophisticated dance vocabulary of Black Cake. Sound good to you? Share this page on social media and let your friends know about Hungarian State Opera - LOL: Three Pieces by Hans van Manen at David H Koch Theater. Please note: The term David H Koch Theater and/or Hungarian State Opera - LOL: Three Pieces by Hans van Manen as well as all associated graphics, logos, and/or other trademarks, tradenames or copyrights are the property of the David H Koch Theater and/or Hungarian State Opera - LOL: Three Pieces by Hans van Manen and are used herein for factual descriptive purposes only. We are in no way associated with or authorized by the David H Koch Theater and/or Hungarian State Opera - LOL: Three Pieces by Hans van Manen and neither that entity nor any of its affiliates have licensed or endorsed us to sell tickets, goods and or services in conjunction with their events.